A Painting Today: "Express Yourself"
Mark Rothko was a complex, educated man and it would be futile for me to even begin to analyze his paintings, especially the color fields in his abstract expressionism works. I will include a quote from Rothko that does it for me - "The fact that people break down and cry when confronted with my pictures shows that I can communicate those basic human emotions. The people who weep before my pictures are having the same religious experience I had when painting them. And if you say you are moved only by their color relationships then you miss the point." 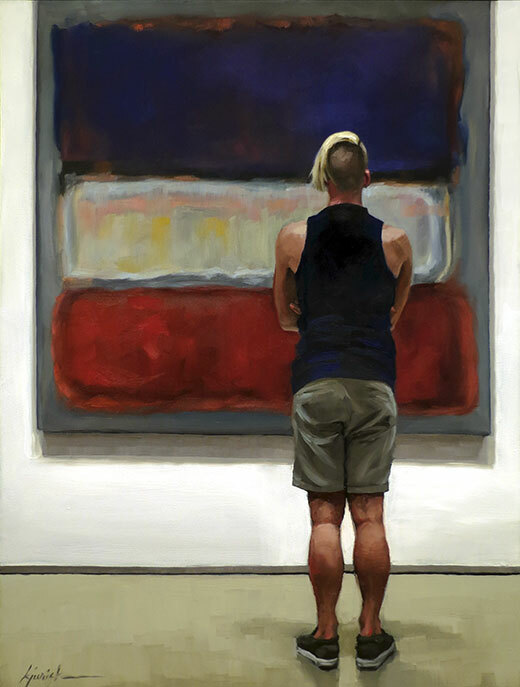 A young man stands before Mark Rothko's Untitled, (Purple, White and Red) in the Art Institute of Chicago.